Loaded with standard features, the stylish Crownline E25 keeps the bottom line low. The new flagship of Crownline’s deckboat line is designed as a no-compromise way to have fun on the water. 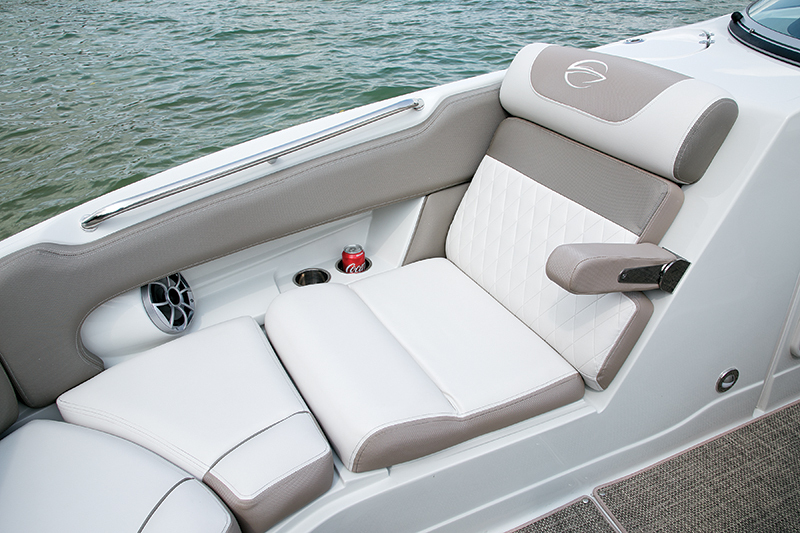 With plenty of seating for its 13-passenger rating, everyone gets a throne on the E25. And while Crownline is a premium brand that is usually priced accordingly, it has created a fully loaded version that’s not underpowered, for $71,995, including a dual-axle trailer. Back in 2002, Crownline pioneered a concept called the Social Swim transom, which allowed guests on its boats to relax in back when the key was off. With the E25, designers have taken that design element to a new dimension. Transom lounges with flippable seatbacks are all the rage these days, but many of them have just a couple of positions, which might not be the current occupant’s perfect angle for reclining. Crownline designers solved that problem with an electric backrest that allows passengers to dial in the position that’s right for them, in addition to looking pretty cool. 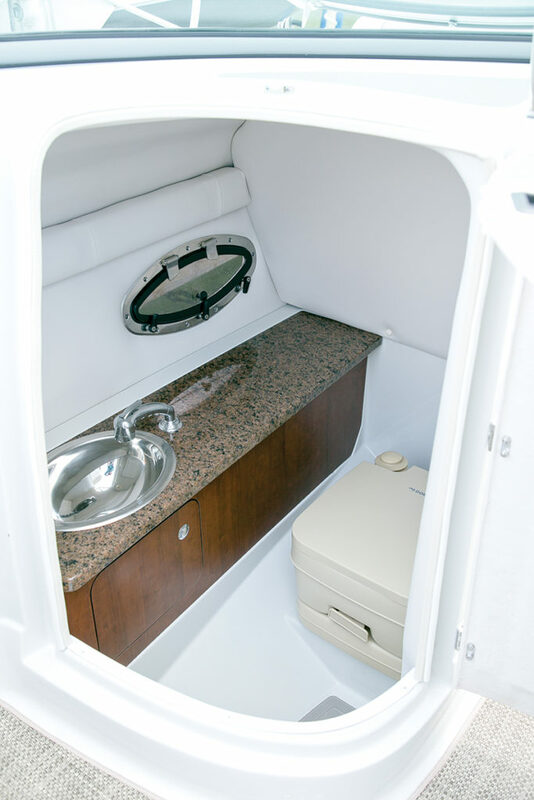 The transom is maximized with standard features such as a padded swim platform with a hidden four-step boarding ladder, a rope locker and a transom shower. And because it’s a sterndrive-powered boat, there’s no outboard engine well to bisect the oversized platform, so it’s all usable space. Sometimes, a good stereo is one of the first casualties on a “price boat,” but our boat’s standard Kicker KMC10 head unit paired with eight Wet Sounds speakers — two of them on the transom to entertain people in the water — put that notion to rest. 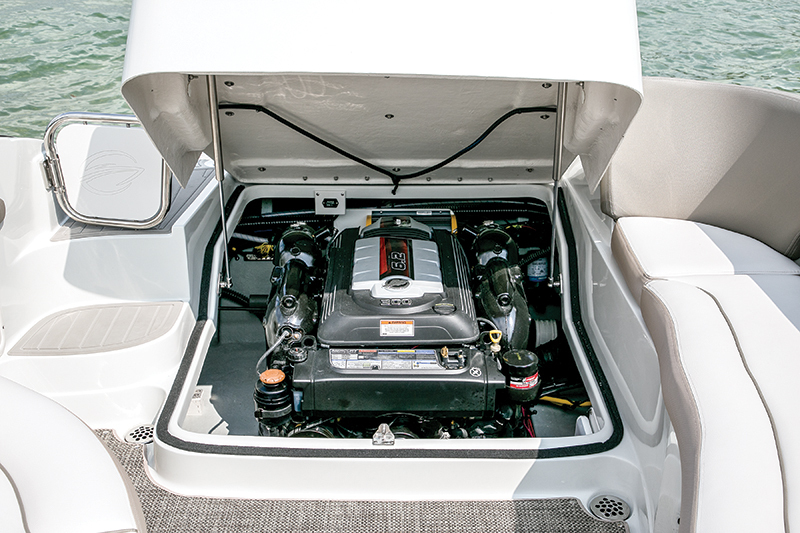 We tested the E25 on Lake Lanier, north of Atlanta, with the standard sterndrive package that includes a new-generation MerCruiser 6.2L V-8 that puts out 300 hp. For better performance with zero prop torque, the package includes the twin-prop Bravo III outdrive. Crownline’s F.A.S.T. Hull (Fin Assisted Safe Turn) has been tweaked on the E25, giving it better performance and handling. Among its main design elements are vented chines, which introduce air under the hull to reduce performance-robbing friction and allow it to perform well without needing a huge amount of power. It also has a full-length keel pad that generates extra lift. These innovations helped it get out of the hole in 3.4 seconds and with minimal bowrise. Time to 30 mph was 6.8 seconds, and the E25 reached a top speed of 47.8 mph, which is good for a boat that stretches 25 feet, 3 inches long and has a dry weight of 5,701 pounds. Buyers can get the E25 with up to 380 hp, which we estimate will put its top speed in the low to mid50s, but upgrading to this big-block 8.2L “MerBruiser” will increase the MSRP to $101,971, if the DTS option is included, which provides an idea how much the builder is discounting “The Package.” So while we normally say more power is better, this is one case where the minimum wins. One of the most overlooked aspects of boat handling is how a sterndrive boat performs at idle, where there tends to be a maddening-to-newbies phenomenon known as stern wander. It causes mostly midsized boats to stagger from side to side down a canal like Otis heading for his cell on “The Andy Griffith Show.” My old 24-foot 1968 Stamas, powered by a Chevy 350 with an OMC outdrive, had this problem in spades. I was the only one who could drive it without attracting the attention of the marine patrol, but that was thanks to many hours of practice. Crownline’s patented hull makes the problem of stern wander a non-issue. Its twin vortex generators create watery tornadoes in the rear corners of the boat; those eddies collect water from the sides and spin it rearward and away from the outdrive. It actually works. Because the F.A.S.T. vented chines introduce air under the hull, they also unstick the hull from the water’s surface tension, which is a drag, and free up the hull to turn more freely, making the E25 feel more nimble in turns than its length would suggest. The hull also features a sharp 39-degree entry for excellent sliceability through the chop. It tapers off to a more moderate 19 degrees at the stern. 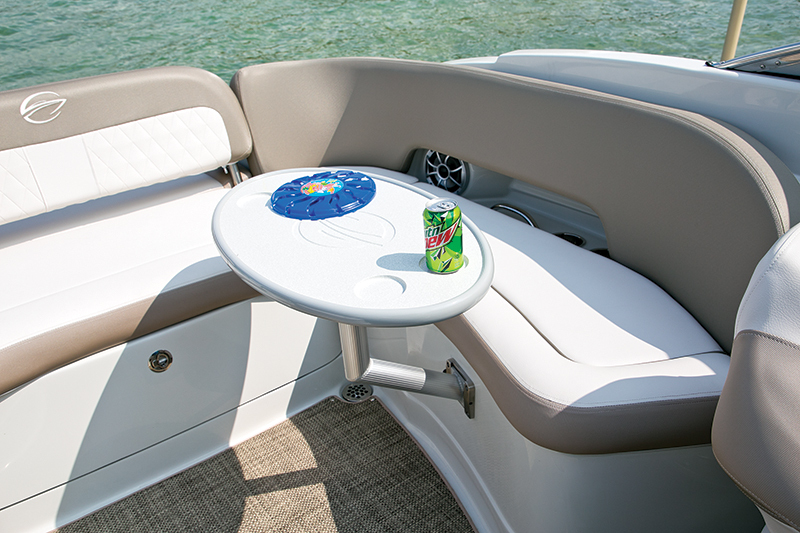 An additional comfort enhancing feature is the built-in suspension system in the crew buckets, which further cushions the effects of choppy water. 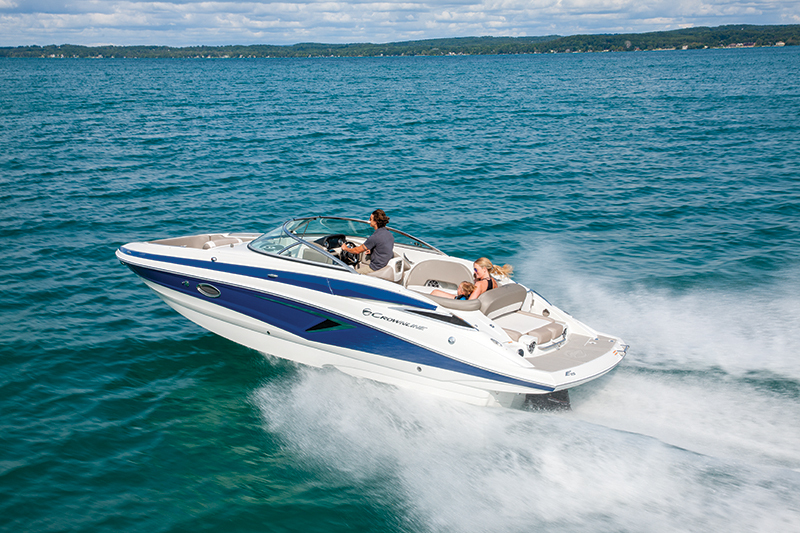 The E25 excels as a cruiser/entertainer/ watersports boat. There’s plenty of seating for everyone in the cockpit on Jwrap seating. No, it’s not a hip-hop artist; rather, it is Crownline-speak for its portside lounge that curves into a stern bench. The builder calls the starboard lounge behind the driver the love seat, maybe because owners will love the 84-quart insulated cooler beneath it. Lots of people aboard mean lots of gear, and the E25’s designers took the hassle out of stowing items, installing hands-free hinges that make it easy to open the gull-wing seat bottoms and keep them open. Another clever feature is located in the huge centerline locker, which is perfect for storing bulky items such as skis and extra life jackets. Inside the compartment is a drawer that slides out to reveal a large, standard, side-mount cockpit table — normally an item that’s difficult to store when it’s not in use. 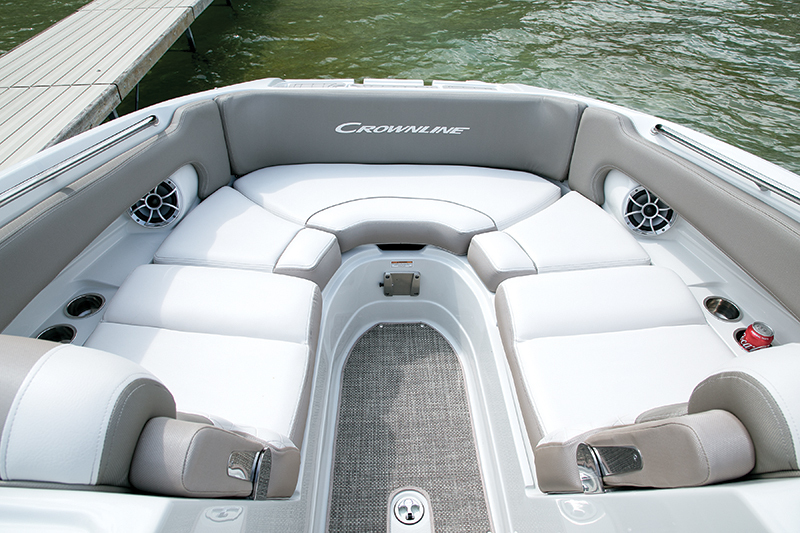 Up front are Crownline’s signature hot-tub seats, but this year the center hump that provides support under one’s knees is less prominent and more comfortable, so sitting upright with one’s feet on the deck is also more comfortable. Because it’s a deckboat, there’s plenty of room for six up front. For beach landings, there’s a fourstep bow boarding ladder and a wide, flat area with nonskid padding. There were only a few options on our test boat, starting with the powder-coated watersports tower ($5,325). Sometimes towers are difficult to drop down, but this one has a feature called the Fold Down Stop, which is a cable-assisted system that allows one person to pull down the tower with two fingers. And it locks in place in the down position. To raise it up, just push the tower down again, which unlocks it and raises it back up. 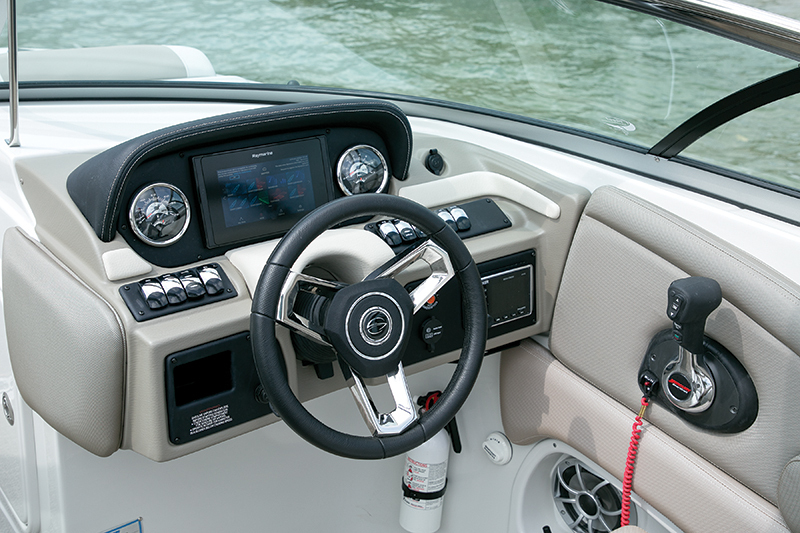 At the helm, our test boat had the Black Dash and Black Executive Wheel, modestly priced at $375, and upscale touches such as double stitching. The black dash also keeps reflections off the windshield. Owners serious about watersports need the Perfect Pass GPS-based cruise control system ($2,135). 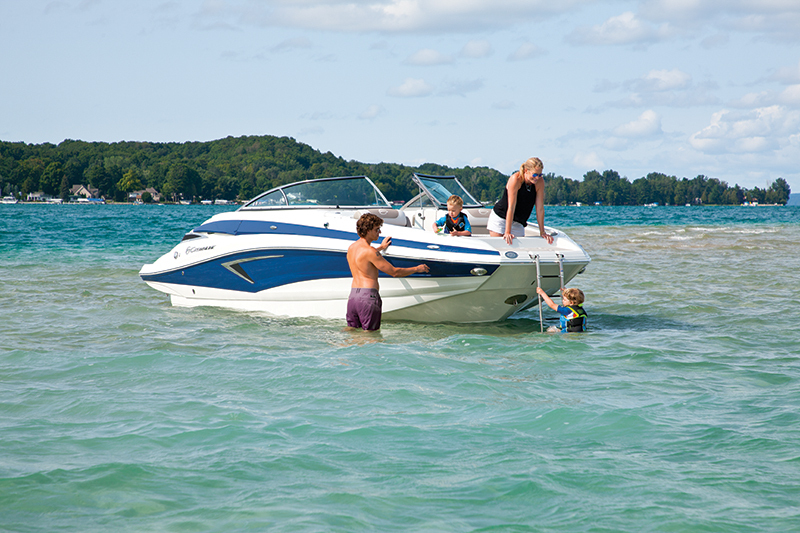 Trim tabs with indicator lights ($1,415) are another must-have option, for balancing the load. The head compartment is human-sized and comes with a portable toilet, a real granite countertop and a shower. Adding the pumpout toilet option is a solid way to spend $525. The standard flooring is Highlander snap-in carpeting, but the preferred option is probably Moonrock vinyl flooring ($1,875). Crownline knows owners will be taking their floating kingdom on the road, so a color-coordinated dual-axle trailer with brakes comes standard. See Boating World’s May Issue Here…..
Watch Their Video Test Too!